Take red chilies into a bowl and add water. Wash the chilies rubbing well between fingers. Spread a cloth on the ground. Spread the washed chilies on the cloth and allow them to dry completely---if possible dry the chilies in sun for few hours to dry well. When the chilies are completely dry remove the stems using a knife as they would be hard to pluck and remove. Then chop the chilies into pieces. Take a dry mixie jar and add sufficient chili pieces and grind coarsely. Take the coarsely ground chili mixture into a clean and dry bowl. Similarly grind all the chili pieces coarsely and add to the bow. Add salt and mix well. Make a well in the centre and add the tamarind in the well. Cover the tamarind with the chili mixture. Cover the bowl and keep it in a dry place for two days. On the third day the pickle would be ready for seasoning. Take a dry mixie jar and keep it nearby. Separate the tamarind from the chili mixture using a spoon. Take the softened tamarind into the mixie jar and grind. In between scrape the sides of the mixie jar and grind the tamarind to a fine paste. Take the ground tamarind paste into a bowl. To the mixie jar add some chili mixture and grind coarsely. Add the ground chili mixture to the tamarind paste. Similarly grind the entire chili mixture and add to the tamarind paste. Mix this mixture well. At this stage if one wishes transfer this mixture into ceramic jars or glass jars and store. As and when required take some pickle and add roasted fenugreek powder and season it to get the fresh flavor every time. For measurements convenience to our viewers, here I am using the entire mixture to season it. Heat a pan and add fenugreek seeds. Fry the seeds on low flame stirring continuously for even browning. 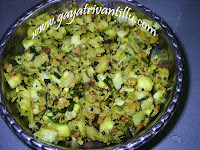 Once brown remove transfer the roasted fenugreek seeds to a plate and allow them to cool. As the quantity of fenugreek seeds are less use a mortar and pestle or a spice grinder and make a fine powder. Add this fenugreek powder to the chili mixture and mix well. Now the pickle is ready for seasoning. Heat a pan and add oil to it. When oil is hot add fenugreek seeds and mustard seeds. Fry the seeds well till they splutter. Then add asafetida and mix well. Add this seasoning to the prepared pickle and mix well. The pickle is ready---transfer to a bowl and serve with hot rice and ghee. Select good quality red chilies whose stems are green and appear fresh---such chilies have moisture which oozes out when salt is added. Always use a spoon while handling the chilies as it takes nearly half an hour to get rid of the burning sensation when comes in contact with the skin. Always use new tamarind to prepare this pickle. The red chilies have a distinct color and old tamarind makes the pickle look brown in color. New tamarind does not hamper the bright color of red chilies. Some even add lemon juice instead of tamarind to retain the bright color of chilies---however I have not tried with lemon. Addition of salt varies depending on how hot the chilies are. If the chilies are very hot then increase the amount of salt and tamarind accordingly and vice versa. As the chilies would be hot to taste just like that to check the hotness—it is advisable to roughly estimate how much salt one is going to add to the quantity of chilies taken and initially add just two-thirds of the taken salt and the remaining may be added at the time of seasoning after tasting the pickle. This way one can have control on the amount of salt. 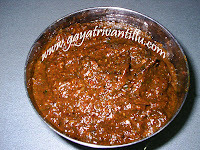 Here I have used just 250gms of chilies which would yield about a cup of pickle. This quantity of pickle would last hardly for two weeks---so I have added salt and tamarind moderately only. If one wishes to have this pickle in large quantity increase the quantity of tamarind and salt as these two work as preservatives in this pickle. After washing it is very important to dry the chilies as any amount of moisture would spoil the pickle by getting fungus. So it is advisable to dry in sun (if possible) for few hours. After adding salt moisture oozes out of the chilies. So make a well in the chili mixture and add tamarind in the well. The moisture oozed out of the chilies would make the tamarind soften. 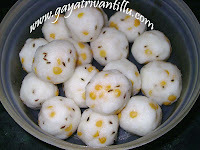 It is advisable to add tamarind as a lump as it would become easy to separate once it softens. Also remove the seeds and pith of tamarind before adding to the chili mixture for easy handling. Initially when grinding the chilies, grind them to get big flaky texture---grinding just helps the moisture to ooze out when salt is mixed. When grinding the chilies after they have softened, grind them to a small flaky texture. Never grind the chilies to a smooth paste as the texture brings the look and flavor to the pickle. After grinding the tamarind and chili mixture store the pickle in ceramic or glass jars. As and when one wishes to have this pickle—take required quantity of chili mixture and add sufficient quantity of roasted fenugreek powder and season it—so that every time the pickle tastes fresh with the fenugreek powder and asafetida seasoning. Roast the fenugreek seeds stirring continuously on low flame for even browning. A roasted fenugreek seed when crushed and observed should appear brown even from inside----this happens when roasted stirring on low flame only. Serve this pickle with hot rice and ghee and enjoy in pure Andhra style. This pickle even goes well with curd rice, dosa, idli, pesarattu or even as a spread on toasts!! !